Travertine can range in porosity depending on the surface type. Polished travertine is less porous than a tumbled version of the same travertine tile. This is due to the pours in the travertine tile closing up during the polishing process and in turn decreasing the porosity. Never the less, all forms of travertine do need sealing, but depending on the cut and style you have, the amount of seal required can vary. Please note when we use the word seal in this article, we are referring to an impregnating sealer. This soaks into the stone rather than a topical sealant which sits on top (often used to change the appearance). Please see out post on the difference between seals and impregnators for more information on that topic. Impregnating seals can come in both water and solvent based form. We most often use solvent based form as it is much stronger and help prevent again all water and oil based stains. Unlike water based which only protect again water based staining. The best impregantor we had found are either lithofin or Fila. 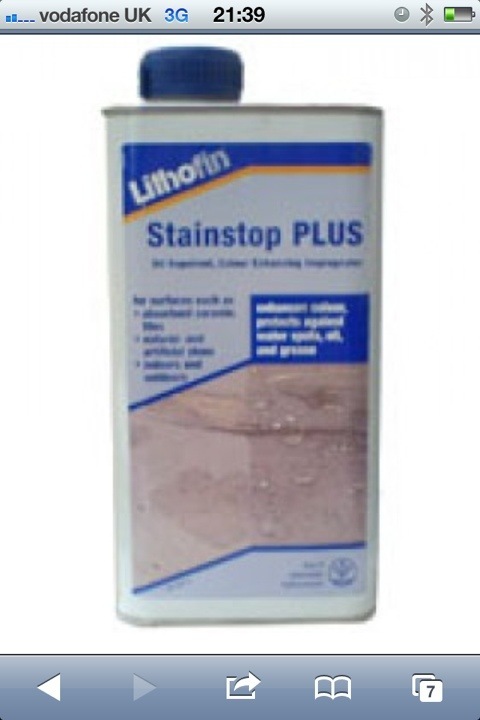 My personally favourite is lithofin MN stain stop. This is extremely strong and tends not to change the appearance of the floor. Although it does have a strong smell to it, but at least you know it’s working. Travertine tiles should only need a couple of coats if they have been treated correctly by the tiler that laid your floor. Travertine should be sealed as soon as it comes out of the box. It should then be laid using the correct adhesive. Once the adhesive has completely dried, the tiles should be sealed again before the grouting stage. This will help prevent the grout bleeding into the tile and staining it. Once again, when the grout has dried completely, normally 24 hours after, both the travertine tiles and the grout should be Sealed. If the tiler performs the fitting as above with the correct seal methods, your tiles should already be pretty well sealed. The best way to check if your tiles are sealed correctly is to do a water test. If when water is poured on you floor it balls up and sits on top, this indicates your tiles are sealed correctly. Like when water goes on to a carpet that has scotch guard on. If water only balls up in some areas and not in other this means your floor requires more sealer. Your floor should be sealed to the saturation point. This is where your tile starts to reject the seal and it kicked out back on top of your tile. Once the saturation point has been reached, your tiles are sealed completely. As I said before, your tiles will differ from others and it will take longer for certain floors to reach the saturation point. Recently we sealed a limestone floor which required 9 coats and we used 13 litres of seal. For the size of the area the manufactures recommended that we only need 2 litres. So you can see how following manufactures instruction can not guarantee your floor been sealed correctly. This entry was posted in fila travertine protector, floor protection, Grout Sealing, how many coats of seal does it take to protect mt travertine, impregnator, limestone, lithofin stain stop, sealing, sealing floors, Stone Issues, Travertine and tagged coats, Fila, floor protection, floor sealing, how, how to seal travertine, impregnating sealer, impregnator, limestone, lithofin, many, seal, sealing, sealing travertine, stain stop, Travertine. Bookmark the permalink.